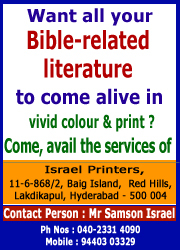 It kick-started in my own local Church namely Christian Fellowship Church, SR Nagar, Hyderabad on 15th Aug, 2009 and then it started moving to different places' in our country. It was Bhuvaneshwar's (in Orrisa) turn to host the same on 25-2-2010.Yes, by the God-given inspiration, yet another seminar on the Book of Revelation (the last book in the Bible and very relevant to the times, we live in) was held in WME Church, Bhuvaneshwar, Orrisa on 25-2-2010, thanks mainly to the initiative taken in this regard by Sister Anitha Aidayantz one of the co-founders of the Bethel Church, Jatni, Orrisa. This devout sister in faith is also the Prinicipal of Bethany School, Vizag (the Church namely Vizag Christian assembly meets in the premises of the said school). Her local co-ordinator at Jatni namely Pastor George Littlewood of Bethel Church did all the spadework by making all the requisite arrangements. May the good Lord richly bless Sister Anitha and Pastor George Littlewood for the zeal for Jesus' Kingdom! The seminar was well attended, with participants numbering up to 100. In the said seminar, which began with enthusiastic praise and worship time, there was a 8-hour power point presentation on the Book of Revelation by yours truly. Needless to say, the said programme was interspersed by tea breaks and a lunch break. The response of the participants at the end of the said programme when they confided that the they could now understand the Sovereign God�s great plan for mankind in the most confounding Book in the entire Bible was a reward in itself for this tired servant of God (yours truly) at the end of it all! Here are some snapshots of the programme concerned at Bhuvaneshwar.